Life is full of surprises, if only we took the time to pause and pay attention more often. On several occasions I dashed along Marylebone Lane, looking at the restaurant at No. 108 and thinking that there was something about it, yet never pausing to peer in. On the occasion that I finally did, I became smitten, so much so that I now look for excuses to go there to have breakfast or just grab a juice or smoothie on the run. Juice or smoothie you ask? What’s special about another juice place? Well, once you go inside, you will understand why I welcome The Juicery at 108 Marylebone Lane with open arms for its first pop-up straight from New York. The Juicery hails from New York city. It is a delicious, healthy, nutrition-led brand & its first European pop-up right in the heart of Marylebone is already making waves among the people in the know. Last week, Marylebone Hotel, owned by the Irish Doyle Collection group ( they also have hotels in Bristol, Dublin, Cork and Washington DC, as well as two more London hotels-one in Bloomsbury and another at South Kensington ) hosted an official presentation of The Juicery. Amelia Freer, a well-known nutritionist who helped Boy George slim down back to health and creator of some of the signature smoothies at the Juicery, was supposed to be a guest of honour but unfortunately she couldn’t make it and guests were welcomed by the hotel’s manager Frits Potgieter and a blonde goddess of health, beauty and nutrition Calgary Avansino. Marylebone Hotel is a discreet place that has already become popular with business travellers but the approach of this hotel is placing importance on their guests having fun, enjoying the sense of being in the modern club to which one would want to come back to. The food and beverage concept ( supervised by chef Russell Ford ) is that the produce used has to be seasonal ( when possible using local suppliers ) and full of nutritional goodness at its ‘peak’. The hotel aims to celebrate being part of the beautiful neighbourhood with a village charm, where people actually know each other. Introducing The Juicery within the hotel wasn’t originally planned but somehow events took place and with notable doctors of holistic health on-board-Dr Frank Lipman and Dr Alejandro Junger, as well as the above mentioned and London based Amelia Freer as well, the concept of The Juicery in London took shape, with the emphasis on juices and smoothies and shots tasting as good as they are for you. The Juicery will become a platform for experts on healthy lifestyle and I hope events like the one that took place last Friday will become regular. Calgary Avansino, British Vogue’s Contributing Editor and healthy eating expert, as well as the beauty and brains behind the soon to be launched website, told the assembled guest crowd ( I spotted the Hemsley & Hemsley sisters, Clare Neill-one of the lovely founders of the Radiance Cleanse, upcoming fitness fashion star Charli Cohen and Anjhe Mules, founder of Lucas Hugh ) about one of the most popular question that she is being asked on a regular basis: ‘ What should I give up’, which in itself is such a negatively put question. We all know that when we deprive ourselves of something, we tend to want it twice as much. According to Calgary our approach to daily diet should be ‘What should I eat?‘ One of the most important blocks of your diet should be eating greens, like broccoli, celery, kale as those vegetables have the full life-force of nutrients and will nurture and nourish you from inside out. You can easily freeze them, juice them, stir fry them, steam them. Another important thing to note is that juicing is great for you but you should aim for juicing vegetables over fruit. In our day and age we tend to overeat, thus putting too much pressure on our digestive system. Add to that lack of quality sleep, constant stress and environmental aggressors and the picture before your eyes will look bleak. You can aim for meatless Mondays, as it can be a fun way to engage with your friends or an excuse to make veggie tacos for your kids, as well as their friends coming over for a playdate. Calgary also advocates seasonal box deliveries of fruit and vegetables ( Abel & Cole springs to mind ) as it will allow you to discover new produce and tastes. Are you a fan of grains? No, not the likes of white rice but brown rice, millet, quinoa, oats, polenta, buckwheat instead, with their lower glycemic index and nutritionally dense content-no high energy spikes-instead you get a slow energy release and no heaviness in your stomach and sleepiness after eating. Calgary wryly noted that Dr Atkins is dead, and the point resonated with me somewhat as I love my meat but am not so keen on greens ( thank you Organic Burst for changing that though !). You can soak your grains overnight in water and have an almost ready-made base for healthy and filling breakfast. Lots of people I know have an aversion to having fats in their diet, not realising that by taking the good fats of their diets as well, they are starving their body and brain (!) of vital nutrients and possibly leading to diseases like Alzheimer’s later in life. Ban saturated fats but introduce nuts, coconuts, avocados into your diet, as they contain good Omegas and fats, will fill you up and help balance your sugar levels ( they are also very good for your skin, hair and nails ). You can’t eat rice cakes all the time, so add a ‘perfectly portable snack’, according to Calgary, nuts and try to eat a variety of them. When it comes to coconuts, the smell alone makes you think of a holiday, so fry with it (it has a much higher burning point than many other cooking oils like corn or olive oil don’t have), bake with it, spread it on your toast or pore over the roasting veggies. The benefits are multiple, including your skin and hair loving you for it. When it comes to children, Calgary suggests starting their exposure to a varied diet from early on and ‘training’ their pallette: ‘Once you give it to them, it won’t go away’. The best way is to approach your kids nutrition head on and do what Calgary does-‘don’t have things or food in your kitchen that you are going to argue about and never underestimate kids ‘sponginess”. When your energetic ‘fireballs’ come home from school put a platter of different pre-cut vegetables in front of them to munch on and see if they like it. Don’t say anything or force them to have it-just put it on the table and walk away. Trying something new is always an interesting experience, lately chia seeds have been getting lots of spotlight for their high Omega 3, 6 and dietary fibre content-try chia puddings and I promise you won’t look back, and neither will you kids, as unlike us, they are much more open to new experiences and tastes. We are here ‘to teach not preach’ says Calgary and like everything in life, diet should be about balance, not depriving or forbidding something. When a question about dairy came up from an audience, Calgary says that her honest personal opinion is that milk should be drunk by cows, while grown-ups should try almond, oat, rice, coconut milk instead. Life shouldn’t be about dieting but about enjoying the foods that make you feel good, as one of Calgary’s favourite slogan’s goes ‘Strong is the new skinny’. Whizz a millet porridge, make a raw juice, plan ahead. 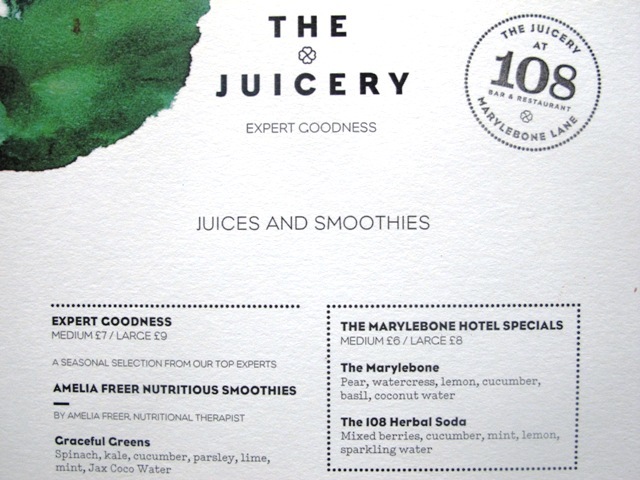 The Juicery allows you to do just that with a great breakfast options, their Signature Blends to boost anti-oxidants or re-hydrate you, Signature Juices or Single Juices, Boosters ( in the form of maca, superfoods, aloe vera, baobab), Protein Supplements, Jax Coco ( coconut water that is a firm favourite and not just of the fashion crowd-it comes in a glass bottle and was served with fresh blueberries during the presentation). You can also try Signature Expresso Blends, Single Shots (try ginger and tell me that it doesn’t wake you up better than a double expresso ! ), Clean Post-Workout Shakes designed by Dr. Alejandro Junger (his book ‘Clean’ is a must-read for any health-conscious person), Amelia Freer Nutritional Smoothies or Dr. Frank Lipman’s Be Well Vitality Smoothies. Whether you come to the Juicery early in the morning ( it opens at 7am ) for your juice shot, for breakfast or for the post-workout treat, you will leave feeling energised not just by the juices, but by the friendly atmosphere, lovely attentive staff and the air of tranquility in the air. Thank you to Relish Content for a fantastic event and lots of juices and shots that kept me energetic, happy and bouncy for the rest of the day.